Q : How do I register my 789tens Lifetime Warranty? A : Your 789tens Lifetime Warranty should be registered when you complete your order. You can also register it 1) online here, 2) by filling out and mailing in your 789tens Lifetime Warranty card, or 3) in-person with one of our 789tens retailers. 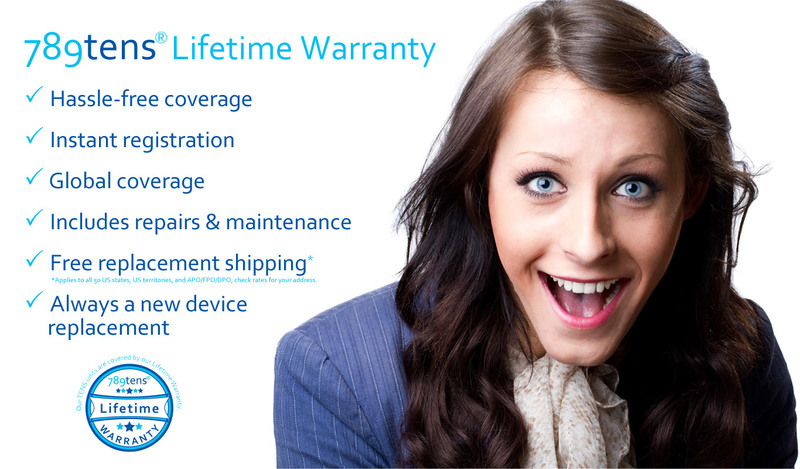 Q : Does the 789tens Lifetime Warranty cover the accessories that are included with my 789tens TENS unit? A : No, the 789tens Lifetime Warranty only covers your 789tens TENS unit. Q : What should I do when my 789tens TENS unit needs repair? A : Please check out our "789tens Lifetime Warranty" page for details and instructions. Click here for printer-friendly detailed instructions (in PDF format). Q : Will 789tens pay for me to ship my damaged TENS unit for repair? A : No, we do not pay for your return shipping. Q : Will 789tens pay for me to ship my defective TENS unit for exchange? A : Yes, we will credit the return shipping of your defective 789tens TENS unit under BOTH conditions: we receive notice of your defective unit within 30 days of its delivery date, and we confirm that your unit is defective. Please check out "789tens Returns Policy" for more details. Q : Will 789tens pay for shipping to me, my repaired or exchanged TENS unit? A : We pay for shipping repaired or exchanged TENS units within the 50 states, U.S. territories, and AFO/FPO/DPO. For other international shipments, please check out "789tens Shipping Rates" for details. Q : Will my 789tens Lifetime Warranty be voided if I use my 789tens TENS unit outside of the United States or Canada? A : No, there are no restrictions on where you can use your 789tens TENS unit. Q : Will my 789tens Lifetime Warranty be voided if I use TENS accessories from a different brand with my 789tens TENS unit? A : No, you can use any brand of TENS accessories with your 789tens TENS unit. Q : What can void my 789tens Lifetime Warranty? A : The conditions under which your 789tens Lifetime Warranty can be voided are, when your 789tens TENS unit ceases to exist (including theft), or when mandated by court or law. A: The 789tens service fee for repairs and replacements of damaged 789tens TENS units is currently: $30.